Milad was born in Iran, grew up in Sweden and now lives in Denmark. But thats just the surface – he is actually a man of the world. He graduated from The Danish National Film School in 2011, and since then things have just gone up and up for Milad. He’s been selected for the Director’s fortnight in Cannes, his shorts have been selected on over 40 festivals throughout the world and he’s won a Danish Academy Award. Lately he finalised his first feature “The Charmer” which will open in the spring of 2018. It has, however, already pulled the awards of the shelves in Warsaw, Chicago, Lübeck and not the least the San Sebastian Film Festival. So Milad knows the world. And he knows how to makes movies. And we know him and he knows us. Its a great winning combo and means that together we make ads, videos and stuff in between around the world. 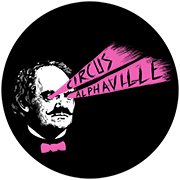 © Circus Alphaville 2019. All Rights Reserved.